A few projects have come and gone. The latest one that I actually finished was a little memory keyer. I started with the code I used for the morse keyboard project, but changed it quite a bit, both because I needed to support a standard CW paddle as the primary input device and because I wanted to build this project from scratch with a little Atmel MCU rather than with an Arduino. 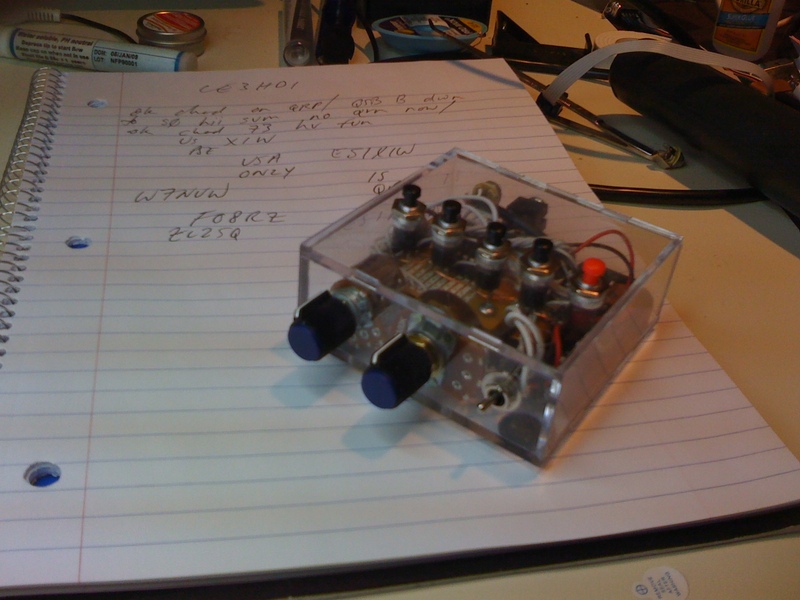 I have used this keyer for several QSOs and it works well enough. However, before I adopt it as my primary keyer, I’ll need to add some big new features like a USB interface so I can control it from my PC and the ability to take command/control via morse code. I also want to hook up a keyboard directly to it (since I have all the code to support it) but haven’t done so yet. I don’t have time to write up all the details of the circuit or to explain all the code, but I’m posting the source in the hope that some of you will find it useful. Let me know if this helps you build something cool! If you are just looking for the ASCII to Morse conversion table then you can get that here. Note that I’ve used non-standard keys for pro-signs. The full source is here. Remember, I haven’t actually added the keyboard to mine yet, and you’ll have to do a bit more work (but not too much) if you want to do that.